“United Passions” is a movie that FIFA spent $27 million of its own money to fund and is clearly a complete waste of money. The movie was shown this past weekend at the Zurich Film Festival, and besides those in attendance not many more have seen this movie. The movie is supposed to tell the history of FIFA, but when possible viewers realize that FIFA is paying for it, the desire to see it dwindles as it comes across as a propaganda ploy and less of an unbiased movie about one of the largest organizations in the World. After all, not only FIFA funded the movie, Sepp Blatter approved the script. If this doesn’t have all the hallmarks of a propaganda film I am not sure what does. Considering FIFA headquarters is in Zurich, you would think such a movie and Sepp Blatter’s pet project would have a better turnout, but only 120 people attended the movie screening in a 500 capacity theater. The most expensive tickets were $22.70, almost as much of an over price as a hotel room in Brazil during this summer’s World Cup. Only seven countries have released the movie in local theatres since the debut screening in Cannes during the month of May. From those seven nations, Russia is the country in which the movie did better. It earned $144,000 during a two week span, and then the demand dropped and it closed abruptly. In Portugal the movie only lasted for two weeks as well before the plug being pulled, earning only $2,700. Not all FIFA officials were aware that the movie was being funded by FIFA. Only in June of this year FIFA’s finance director Markus Kattner confirmed that FIFA paid for 90% of the films budget. Through the process FIFA was very tight lipped over the financing of the project, with no official announcement or press release being made. Even Blatter himself had dodged questions over the funding for this movie, in the lead up to the start of the project. The movie is a complete snore fest, too much talk about absolutely nothing and not enough real content, drama or action to keep the viewer engaged with it. IMDB users have rated it 3.2 out of 10 which is deep in the relegation zone. This movie is sure to come out on DVD in time to fill in some stockings of some naughty kids in replacement of coal. 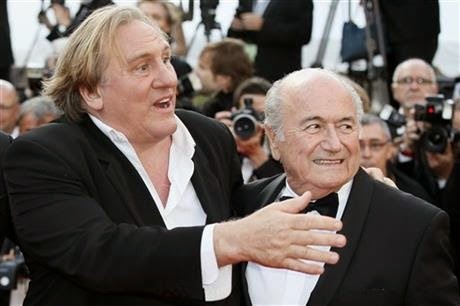 FIFA sure knows how to spend money on absolute garbage, not even Tim Roth, Sam Neill and Gérard Depardieu could save this script and movie from absolute failure, perhaps most of the funding went into convincing them to be part of the cast. Maybe it was a change in dynamics at FIFA, instead of being bribed they had to be the ones doing the bribing. Film is the most accessible of all the arts in many ways. Many people around the world will never visit some of the best museums, but nearly everyone will have seen a movie at some point in their life.